A brief look at Dresden Porcelain and the Dresden Crown mark. 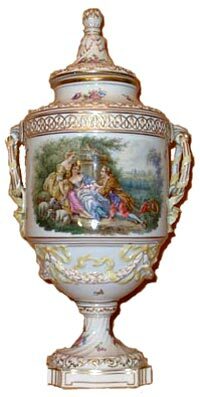 Dresden Porcelain is often confused with Meissen porcelain, but only because Meissen blanks were used initially. In fact, several competing ceramic studios emerged under the Dresden umbrella, particularly in the Saxony capital in response to the rise of romanticism during the 19th century. Dresden was an important centre for the artistic, cultural and intellectual movement, and it attracted painters, sculptors, poets, philosophers and porcelain decorators alike. It was not the porcelain factories but the painting studios that were responsible for Dresden Porcelain being so well known all over the world. There were at least forty porcelain painting studios located near or in the city of Dresden. All of which were decorating porcelain in the Meissen style and a large percentage of the porcelain was produced by the Meissen factory. Most of it being seconds, sold in the white, that didn’t pass the Meissen factory quality control. In 1883, in response to the exciting developments happening all around them, four prominent ceramic decorators registered the famous Dresden blue crown mark, and the widely popular dresden style was born. This misunderstanding also dates back to the early years when the secret of European hard paste porcelain, was discovered under the commission of Augustus the Strong in the city of Dresden. In 1710, however, the first porcelain producing factory was set up fifteen miles away in the city of Meissen. But most Meissen porcelain was sold in Dresden, which was the cultural and economic centre of Saxony. This resulted in Meissen figurines and porcelain being referred to as Dresden porcelain even though they were marked with the blue crossed swords mark. 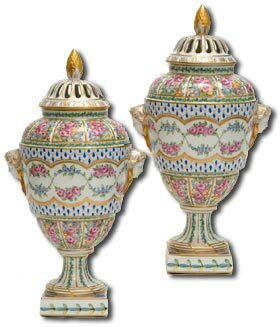 Today most ceramics collectors are aware that although the work of Dresden decorators often rivaled Meissen products; no actual porcelain was produced in Dresden. Dresden porcelain is often described as Rococco revival style. Rococco comes from the French word rocaille meaning rock work or grotto work, and refers to artificial grottoes used in French gardens and decorated with irregularly shaped stones and seashells. Popular during the renaissance, rococo experienced a revival during the 19th century, and influenced almost every aspect of interior design. Dresden decorators were the first and most successful to employ the style on dinnerware decorated with elaborate and fanciful designs using a profusion of foliage, flowers, fruits, shells and scrolls. 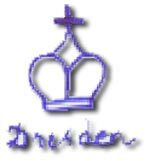 Dresden housed over 200 painting shops; but the dresden style is always associated with wares bearing the blue crown mark first registered by Richard Klemm, Donath & Co., Oswald Lorenz, and Adolph Hamann in 1883 and the type of wares they produced. The style they employed used a mixture of Meissen and Vienna flower and figure painting. Later, other decorators employed the Crown and Dresden mark, and names like Franziska Hirsch, Ambrosius Lamm, Carl Thieme and Helena Wolfsohn became associated with dresden porcelain. Crown Dresden is porcelain produced by outside decorator Helena Wolfsohn, in Dresden in the 1870s. 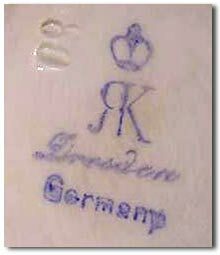 Wolfsohn originally used the Meissen Royal factory mark on her products, in particular a variation of the Meissen AR (Augustus Rex) mark. Following a lawsuit brought by the Meissen company, she was forced to drop the AR mark and adopted a crown with ‘D’ scripted beneath. Her work was typically decorated with pastoral scenes, inspired by the French artist Antoine Watteau and interspersed with panels of flowers. Karl Richard Klemm, located in Striesen and founded in 1869. The Klemm Dresden crown was registrered in the RWZR under number 24. Donath & Co, located in the Wachsbleichstrasse 25 and founded in 1872. The Donath Dresden crown was registered in the RWZR under number 25. Oswald Lorenz, located in Dresden as a commission agent. The Lorenz Dresden crown was registered in the RWZR under number 26. 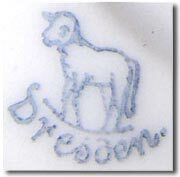 All the above studios were decorating porcelain in the meissen or vienna style; and marking their pieces with the sam dresden crown mark. The dresden collector will find it quite impossible to identify the exact origin of wares produced at this time. After a few years though, each of these studios did register their own specific marks at the RWZR and it became easier to identify indivual studios.